Nabe is one of those things that it’s almost ridiculous to use a recipe for. It makes much more sense to follow a simple formula: flavorful broth + vegetables + protein + starch = delicious. 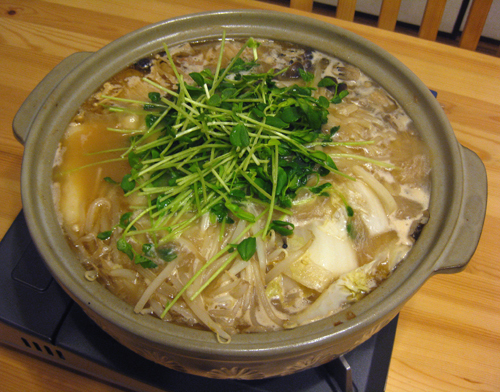 The broth is almost always based on dashi (although you could use chicken or vegetable stock if you liked) and can be flavored with soy sauce, miso, spices, or kept plain; the vegetables can be absolutely anything; the protein can be meat or soy; and the starch can be noodles, rice, or mochi (glutinous rice cakes). Despite this, I found myself following my husband around the kitchen with a notepad in late November as he threw this nabe together. Part of the reason was that I wanted to post it here, but I also just wanted to have some kind of record. Tsuyoshi is the kind of cook who doesn’t like using recipes and therefore his nabe turn out slightly different each time, and I was curious to see exactly what he was doing differently. Please consider this recipe a rough guideline to be tweaked as necessary depending on your preferences and what ingredients you can find. It can be easily modified to feed a large number of people if you simply increase the amount of broth, vegetables, and protein (which can be added in several batches at the table) and keep plenty of dashi on hand to add to the pot when the liquid is getting low. This meal is also very vegetarian friendly – I like to add a small amount of meat to make the broth more flavorful, but you can leave it out if you want. A note about the nabe itself: we use a ceramic nabe that is a Japanese size 9 (approximately 23.5 centimeters in diameter). This is technically the size to feed four or five people, and provides two meals for us. If you don’t have a Japanese-style nabe, you can make nabe in a wide pot– just make sure it’s shallow enough that you can arrange the ingredients inside without having them float around in the broth like soup. It’s also traditional to serve the nabe at the table atop a small tabletop burner sold for just this purpose. I’ve never seen an equivalent outside of Japan (although maybe something similar is sold for camping), but you can certainly keep the nabe cooking atop the stove and get up from the table when you want another serving. Drizzle sesame oil into your nabe. Cook the garlic, ginger, and onion over low heat to flavor the oil. Add the hot peppers and continue cooking while stirring constantly. Add the meat. Cook until no longer raw. Add ½ of the total amount of mushrooms. Cook while stirring until slightly softened. Add enough dashi to cover your ingredients. Simmer gently, using a wire whisk or other implement to remove the aku (scum) that floats to the top. After all aku is gone, use a miso koshi strainer to add the white miso (or remove some of the soup into a small bowl, mix the miso in there, then return it to the nabe). Start by adding a few teaspoons, then taste. Continue adding miso until the soup tastes flavorful but not overly salty – the goal isn’t to make miso soup but to add another dimension of subtle flavor. Add the rest of the mushrooms, Chinese cabbage, tofu, and mochi (optional) arranging them nicely inside the pot. Add more dashi to cover if necessary, but you don’t want to submerge all the ingredients – they should peek out from the broth. Add a final drizzle of sesame oil for fragrance. Mound the greens in the center of the pot. Bring the nabe to the table and set it on the portable stove. Turn the stove heat as low as necessary to maintain a very gentle simmer. To serve, provide each person with a small dish and have them use chopsticks or a ladle to select their own vegetables, meat, tofu, etc. You can put ponzu or sesame sauce inside the dish to dip the ingredients in, or smear them with a bit of yuzu koshō pepper paste. After eating, save all of the savory broth that remains as well as any leftover scraps of vegetables. If you are still hungry you can finish the meal with rice porridge. If not, save the broth and make porridge for breakfast the next morning. Just be careful not to add too much rice, since it tends to plump up and expand. You can either rinse the rice to remove extra starch, or add it to the broth as is to create a heartier porridge. If rinsing the rice, place in a strainer and gently rinse under running water. Add the rice to the leftover broth in the nabe, and cook over medium-low heat until rice begins to plump and expand, stirring to make sure it doesn’t stick to the bottom of the pan. Beat eggs in a bowl. Gently pour into the pot, stirring to cook.